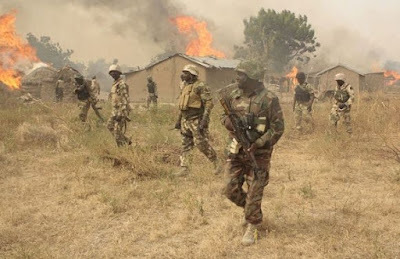 One soldier was killed and two others declared missing in action during a fierce encounter between troops of Operation Lafiya Dole and Boko Haram terrorists at Gwari and Ganye villages of Borno State, where a senior Army officer and 13 other soldiers were wounded. The incident which also saw two terrorists killed by the troops, occurred when the troops were advancing towards Sa’ada village in their heightened efforts to clear the remnants of Boko Haram terrorists in some locations within the area. The wounded soldiers, according to Army authorities, were in stable condition, while concerted effort was ongoing to recover the two others missing in action. Troops Army spokesman, Brigadier General Sani Usman, in a statement, said the troops, while advancing towards the area, met heavy presence of Boko Haram terrorist in the area. “They, however, engaged them and destroyed the terrorists’ makeshift camps at Gwari and Ganye villages. The troops had to withdraw to Forward Operation Base at Kerenoa. Unfortunately, one soldier paid the supreme price; two others were missing in action, while an officer and 13 soldiers were wounded in action.